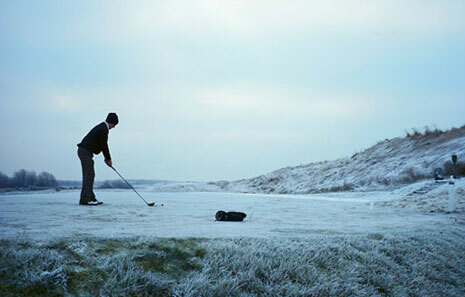 Do you let cold weather stop you from playing golf? That’s no excuse! Here are 5 TIPS for Playing Golf in Cold Weather. Special thanks to Gordon Dalgleish, Co-Founding Director of PerryGolf, for adding his own unique, Scottish cool weather golf tip! This is as important as anything – what you wear. You don’t want to bundle up so much (like Randy, from A Christmas Story) that you can’t even make a good, full swing. Consider wearing multiple layers. I personally prefer wearing a long sleeve thermal t-shirt, like a poly-pro base layer. Depending on how cold the weather is, try a short/long sleeve golf shirt and then a sweater. And if it’s windy, you may even want to wear some sort of light-weight wind breaker. Don’t’ forget to wear a hat of some sort. I prefer wearing a toboggan, as keeping your ears and as much of your face as warm as possible will make a noticeable difference. Be realistic. Chances are you’re scoring average will slightly increase during the cold weather months: golf balls don’t go as far, it’s cold and your body is stiffer, and the numerous other reasonable excuses you could make. What’s important is that you’re still playing golf. You enjoy the game so much that little will keep you off the golf course. Consider playing from the tees up since you won’t be hitting the ball as far. Or it may be beneficial to play the same tees so you’ll have a chance to work on some different shots and club selections. Playing through the cold weather months will do wonders for your golf game. Time away from the golf course is typically a bad decision, for my golf game anyway (or lack there of!). Though I now reside in the United States, being that I am from Scotland and still spend a great deal of time back in my motherland, it is reasonable to say my Scottish roots have indeed carried over into my golf game to this day. It’s no secret that when compared to golf in the States, playing links golf in Scotland is a different game – from the types of courses to a golfer’s course management strategy to the general differences in weather – though indeed escaping the 95 degree, 95% humidity you may be accustomed to back at home can be an enjoyable relief! Playing golf in Scotland is an experience like no other. As the majority of the links courses factored into their designs the presence of ‘the elements’ – you shall most appreciate these layouts amidst a breezy day (though you will often find warm, sunny skies and calm conditions) where it’s best practice to not force your shots and try to overpower the elements, but instead play the type of golf shot which is crafted to fly under the wind with a lower trajectory, or the likes of a bump-and-run when closer to the green. No matter where you’re teeing it up – in the northern US states on a wintery day or wherever – if it’s cold and/or windy outside – I recommend incorporating some of this Scottish golf strategy into your own game. If you think about, due to the cold weather the ground is likely to be firmer, meaning you’ll get more roll and less spin than when playing in warmer climate. Keep your 60-degree wedge in the bag and narrow your margin for error by playing a controlled, bump-and-run or some cases even a ‘texas-wedge’ shot. You won’t get the spin you desire when it’s cold out so use the firmer ground to your advantage. You may not find a bump-and-run or run-up shot as attractive as a high flop shot, but then again there’s no room on the scorecard to describe the shot you hit that landed you that birdie. My points here are not that you should expect to bundle up when you play golf in Scotland or Ireland or England or Wales, though it’s plausible you could encounter a wee bit of cooler weather just as it’s very possible also that you find yourself like many of our clients enjoying a beautiful, warm and sunny day in shorts and short sleeves – check out our Facebook to see some of them for yourself! I have offered these pointers for golfing anywhere in the world when the temperatures are found less than warm. Bonus Tip #1: Enjoy a beverage – this includes but is not limited to: hot chocolate, hot tea, or even an adult beverage. These will all help you bear the cold weather! Playing golf in cold weather may be undesirable for both scratch-golfers and bogey-golfers alike, but for the true, avid golf lover, it’s simply part of the game. I play golf year-round, and although it’s never as many rounds as I’d hope, it isn’t the cold weather that stops me from teeing it up. It’s great exercise (especially if you walk). Pace of play is faster. It’s good practice for playing golf in inclement conditions, as well as those similar to what you can find on a golf vacation to the British Isles. You’ll certainly have a “one-up” on most of your friends the next time they decide the weather’s warm enough to go and tee it up. What other tips do you find useful for playing golf in cold weather?